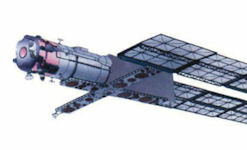 US-P (short for Managed Satellite Passive, GRAU - 17F17 index, also US-PU and EORSAT ) is a series of Soviet and Russian satellites of passive radio technical intelligence. The satellites of this series are part of the global marine space reconnaissance and targeting system of the ICRC "Legend". 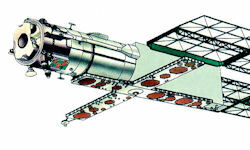 The EORSAT (electronic intelligence ocean reconnaissance satellite) were used with RORSATs for detection and tracking of naval vessels in open or coastal waters.” A secret 1985 General Accounting Office [GAO]t stated "The EORSAT is possibly the Soviet space-based system which is most capable of sea target detection. It provides targeting data of about 2-kilometer accuracy to anti-ship missile platforms (on other ships, helicopters, etc.). In land or air warfare, it would also be used to detect airborne warning and control systems, radar sites and operating airfields." The satellite US-P ("controlled satellite-passive", index GRAU 17F17) is a complex of radio-technical reconnaissance, created for the detection and direction finding of objects having electromagnetic radiation. A newer and more perfect apparatus in the MKRC system was US-P. The letter "P", as you might guess, meant passive radar. US-P did not irradiate the ocean, but carried out the tasks of electronic intelligence, navigating and identifying surface targets for the operation of their radio facilities. This class of spacecraft debuted in 1974 and normally operated in nearly circular orbits between 400 and 450 km at an inclination of 65 degrees. The vehicles are often referred to as EORSATs for Electronic Intelligence Ocean Reconnaissance Satellites. Each spacecraft is essentially cylindrical with two large solar arrays and a nadir-facing cross-antenna. The mass of the vehicle is approximately three metric tons, and the spacecraft demonstrated operational lifetimes of about two years. Normally the debris are relatively short-lived, although during the 1980’s three spacecraft (Cosmos’ 1220, 1260, and 1461) were maneuvered into higher orbits before undergoing fragmentations, leading to longer-lived debris. On this satellite there was no "peaceful atom", and solar panels were responsible for power supply. The USP was lighter than the US-A (2,800 kg versus 4,150), and worked farther from Earth, in orbit 440 km, while having a higher locator resolution than a satellite with active location. The most interesting element of the US-P were the radar antennas. They were an openwork interlacing of many elements that had joints between them, and during the launch they retired to a small container. The first flight the satellite made in 1974 and worked until the middle of the 2000s. In 2007, the last US-P ("Cosmos-2421"), according to NASA, collapsed in orbit (Russia did not confirm this data, saying only the decommissioning of the device). On this the Soviet resource was exhausted and the "Legend" finally became a legend. The average height of the working orbit is 440 km; The inclination of the orbit is 65 degrees; Weight - 2500 kg; Onboard power supply - solar power installation; Engine - LPRE of reusable inclusion. At the moment, only the passive satellites of electronic intelligence of US-P are in the composition of the space group of the Russian Federation. The last of them - "Kosmos-2421" - was launched on June 25, 2006, and it was unsuccessful. According to official information, there were minor problems on board due to incomplete deployment of solar panels. Cosmos 2421 (International Designator 2006-026A, U.S. Satellite Number 29247). was a member of the Russian Electronic Intelligence Ocean Reconnaissance Satellites (EORSATs). Some debris from the first fragmentation of Cosmos 2421 on 14 March 2008 were thrown into orbits with apogees up to 300 km higher than the pre-event orbit of 400 km by 420 km and perigees as low as 200 km. A little more than six weeks later on 28 April, a new cloud of debris from Cosmos 2421 was observed with some fragments now reaching above 900 km at apogee. By early June more than 50 cataloged debris from the two events had already fallen back to Earth, but more than 300 debris were still in orbit, being tracked by the U.S. SSN. The third and thus far final fragmentation event occurred on 9 June when the orbit of the main element of the Cosmos 2421 had decayed slightly to 390 km by 415 km. Once again, more than 100 new debris were observed by the SSN, bringing to 500 or more the assessed total number of debris created as a result of the three fragmentation events. More than 20 EORSAT vehicles have suffered fragmentation since 1974 (Orbital Debris Quarterly News ODQN, April 2008, pp. 1-2; ODQN, July 2008, pp. 1-2). Three fragmentation events of Cosmos 2421 in March-June 2008 led to the generation of 508 cataloged debris. Because of the low orbit of the vehicle at the time of breakup (420 km × 400 km), most of the debris reentered within the same year. By January 2012, all Cosmos 2421 fragments had reentered. The root cause of the many EORSAT fragmentations remains unknown.